Shop Sennheiser MD421II Dynamic Microphone from AMS with 0% Interest Payment Plans and Free Shipping. Featuring a rugged composite body and a strong stainless steel grill, the MD421II is used widely in studios and on stage. Tthe MD421II uses a very large diaphragm element and a humbucking coil to reduce noise and sealed acoustic components provide protection from dust and humidity. The frequency response is 30-17,000 Hz and it has a five position bass roll-off switch which provides equalization control up to 1000 Hz. Low Z. 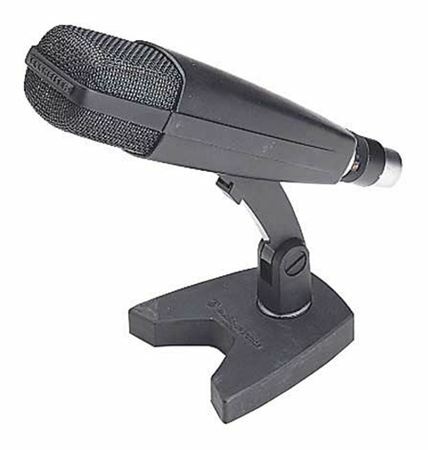 The MD 421 is one of the best known microphones in the world. Its excellent sound qualities enable it to cope with the most diverse recording conditions and broadcasting applications. The five position bass control enhances its all-round qualities. My first time using the Md421 on my David Eden bass rig an was I surprise. Bass was pumping direct in your chest. This MUST to have in your collection of microphones. You won’t regret ait at all. I really enjoy using this mic. Highly recommended. I use it for a lot of different sources, including vocals (and of course, guitars and toms.) I've owned some of the older versions and I like the newer ones because they are consistent. I currently own 3 of these. We got two or these because they are a standard for tomorrow mics and they work better then so many other mics on the market. Ams has been helping us for many years now and they are probably the best thing that can happen to a working studio team. Many Thanks to our friends at AMS. Love it! It works great with SM57! I haven't had it for too long but it seems to be a well built german made mic. This microphone is a wonderful dynamic microphone. I really enjoy the five setting rolloff feature. You can have everything from a nice rich low end, to a crisp nice high end. It's a very simple cardioid only microphone. Just plug it in make sure everything else is on and set how you want. Like I said, the tone is versatile. I use it primarily for recording guitar and bass cabs but it is also good on toms, radio broadcasting and even kick drum. Another got to have mic. The 5 way bass roll off is very nice. Classic 421, slightly bright, slightly open.Sounds pretty darn good on anything you'll use it on. This is a industry standard mic for guitar cabs, bass cabs and drums. You can't go wrong with this mic. These micropohones are well made. The only design issue is you have to have the sennheiser clip to mount the mic properly. The high DB SPL of this mic are incredible. I first ran into this microphone about 12 years ago recording a drummer. We had some Shure 57s but nothing we had worked on the floor tom. The floor tom had no bite and sounded like wet tissue paper. I obtained one of these microphones and instantenously the floor toms roared to life. Also outstanding on lower end toms. I've also used this microphone as a vocal microphone. This microphone was used in the 1960s as a vocal microphone. Though a decent condensor will be a better choice for vocals, this will do and works well on male voices. It's all about the tone. The best microphone I have ever heard on a floor tom and low-toms on a drum kit. Great mic for toms.. and for those of us who's voice dont sound so good useing sub $500 COndenser mics.. this mic ROCKS! Has the bass cut off........ great for toms... and vocals too if need be. Plug and play............. Kinda hard to screw that up huh? Again for those of us that have the MXL V69, and the MXL 2001P, and have tried the lower end Shure dynamic mics... and found they didnt work out for the best... this mic is THE ONE for vocals.